Described by many Brazilians as the “best Brazilian film of all time”, the poetic experimental silent film Limite by Mário Peixoto has been fascinating its audience since its debut in 1931. Yet, it seems that although it is highly renown in Europe, only a few have actually seen it. Both the history of the origins of this cinematic gem and its perception and restoration as the “unknown masterpiece” (Georges Sadoul) offer unequalled opportunities for cinematic history. 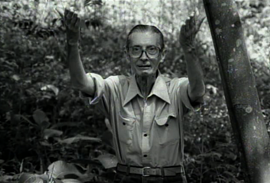 Mário Peixoto (1908–1992) attained legendary status for Limite, his only film. His second film Onde a terra acaba (1933) remained unfinished. Sergio Machado used this title for his documentary, in which he goes on a quest to explore the life and work of Mário Peixoto. He succeeds in producing a haunting homage to one of the most fascinating figures of the Brazilian cinema. Significantly, the directors Walter Salles and Nelson Pereira dos Santos and the main actress of Limite Olga Breno all appear in the film. Sérgio Machado (*1968) is a Brazilian film director and screenwriter. At the 2005 Cannes Film Festival his film Cidade Baixa (Lower City) was screened in the section Un Certain Regard. He is also known for the films: 3 Histórias da Bahia (2001), Madam Satã (2002) and A Morte e a Morte de Quincas Berro Dágua (2009). He wrote the script for Behind the Sun by Walter Salles.